Steel fencing is a perennial favourite amongst those looking for a fencing solution. Steel fencing is sleek, modern, sharp, and flexible but above all it is durable and very low-maintenance. In the busy world we live in having something that is low-maintenance is incredibly important and that’s exactly what steel fencing offers. However, low-maintenance doesn’t mean no maintenance and we all know that you have to put a little bit of effort in if you want to keep something looking good. So, here some tips that will keep your steel fence looking tip-top while still allowing you to spend enough of your weekend on the couch. Use the Hose: There’s nothing easier than grabbing the hose and giving your fence a regular spray down. Your fence will absolutely love you for it. It will make sure that your fence looks good as new and you can even hold a beer in your free hand. Get Your Drainage Right: You need to make sure that there are no places for water to pool up at the bottom of your fence. Steel is tough but if it has to sit in water for a while you will notice some corrosion. A good way to deal with potential corrosion is to have holes punched in the bottom rail of your fence. Watch the Soil: Excess soil is a big problem when it comes to corrosion. Soil absorbs water so make sure you keep the bottom of your fence clear of any soil build up. Painting: If you’re going to give your fence a bit of a touch-up make sure it’s clean before you start. Use a soft-bristle brush to get rid of any debris and then grab the hose and give it a final clean. Use a water-acrylic and give it two coats, just to make sure you don’t have to spend another weekend on the job. We strongly recommend that you always go for a full makeover rather than a touch-up – nobody likes a spotty fence. Be Careful When You’re Doing the Gardening: When you’re fertilising the garden or doing a bit of weed spraying make sure not to get too close to the fence. Both products are highly corrosive and will quickly ruin your beloved steel fence’s shine. Vandalism: If you live in a built up area and have your fence facing the street you may experience problems with graffiti. Chances are you wont be lucky enough to have Banksy spray-paint a million-dollar masterpiece on your fence so you’ll probably want to get rid of it. Make sure you use a good brand of graffiti remover like Du-Pont to avoid any potential damage to your fence. Project Planning: If you think your steel fence is in need of a bit of TLC and you’ve neglected it for a while it’s best to come up with a plan so you can knock a few tasks off in one hit. So, the first thing you need to do is set out your tasks. For example, if the fence is looking a bit dirty and you can see some dirt and water pooling up around the bottom you need to make a game plan. Firstly, you need to come up with a way to drain the water away from the bottom of your fence. This is a pretty easy process of creating a trench and getting the water to run downhill towards a drainage point. Once you’re satisfied with the drainage system you can give your fence a good blast and get rid of all the dirt that has built up. You may find that some of that dirt has caked on and has taken some paint with it, so you need to do a paintjob. Remember, a good fence owner always goes for a full makeover instead of a patch up so grab your paint and set yourself up for a double coat. 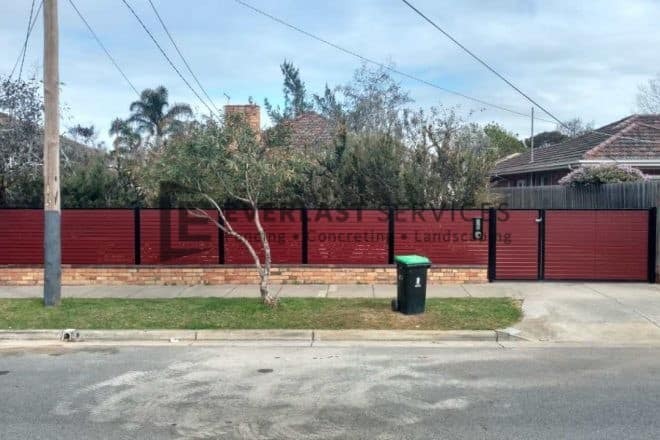 And voila, all you’ve had to do is grab a hose, dig a little trench, spray off some dirt and apply a couple of layers of paint and you have a fence that looks good as new and you also have a fence that you wont have to touch for at least another year or two. Of course, if you do the little things on a regular basis you wont have to do the project at all! If you look after your steel fence it will look after you for decade after decade. There’s nothing quite like the reliability you get from steel and if you want a new steel fence contact the Everlast Services team. We produce all of our steel products from our fabrication plant in Hopper’s Crossing so you can rely on the quality of our steel.